Shauna Parsons—Recipient of the 2015 ATHENA award from the Lynchburg Regional Chamber of Commerce. Owner and President of Evergreen Basement Systems, Parsons earned the prestigious distinction for her business accomplishments, community contributions and commitment to excellence; she was honored as the winner from a pool of 16 nominees at the Women of Worth luncheon on Oct. 30. 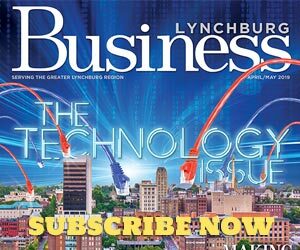 Raul M. Diaz—Appointed Chief of Police for Lynchburg City. Diaz comes to the position with over 26 years of experience in law enforcement, including both local and federal. Prior to his new role, Diaz was promoted to the position of Assistant Chief in 2013. In addition, Diaz also has federal experience as a special agent with the Air Force Office of Special Investigations. Rex D. Geveden —New Chief Operating Officer (COO) of BWX Technologies, Inc. As COO, Geveden will be responsible for execution of BWXT’s government and commercial nuclear operations in the U.S. and Canada. Prior to joining the company, Geveden was Executive Vice President at Teledyne Technologies, where he led two of Teledyne’s four operating segments. He holds both a Bachelors and Masters in Physics from Murray State University. Laurie Gulluscio—Resigned as Director of Marketing and Membership for the Retail Merchants Association (RMA). Gulluscio started with the RMA in the fall of 2010; since then they have more than doubled membership and started the Buy Local Lynchburg program. She has been the Committee Chairwoman for the Lynchburg Christmas & Holiday Parade since 2013. Wanda Ott—New Office Manager with Custom Structures, Inc. Ott brings with her experience in office administration, real estate sales, new construction and property development. She is excited to use her background and experience at Custom Structures. Terri O’Hara—Honored with Virginia’s Outstanding Economic Educator award for 2015 by the Virginia Council of Economic Education (VCEE); O’Hara is a personal finance teacher at E.C. Glass High School. She will receive the award and monetary prize of $1,000 at the 2015 Economic Education Awards Luncheon. Nadine Blakely—Ranked with RE/MAX International as #98 in sales production in the U.S. and #7 in the state of Virginia. A realtor with RE/MAX 1st Olympic and licensed since 2006, Blakely focuses on residential lots and commercial real estate. John Hall—Earned the Certified Financial Planner™ (CFP) designation, which identifies individuals who have met the experience and requirements of the CFP Board, have successfully completed financial planning coursework and have passed the CFP® Certification Examination. Hall has been with MontVue Capital Management, an independent, fee-only firm, since 2012 and serves as their portfolio manager and planning specialist. Lydia K. Langley—Appointed to Board of Directors for Bank of the James Financial Group, Inc. (NASDAQ CM: BOTJ). Langley will serve on the audit committee for the Company and the compensation, audit and loan committees for the Bank. Prior to her new role, she served 9 years on the Planning Commission for the City of Lynchburg and was an original member of the Lynchburg Police Foundation. George D. Vaughan IV—New Vice President, Commercial Officer, at First National Bank. He brings 14 years of banking experience with a focus on mortgage lending for 12 of those years. As a member of First National’s Commercial Lending team, he will seek to cultivate business relationships in the Lynchburg market. Penelope P. Wallace—New Vice President, Commercial Officer, at First National Bank. Wallace joins First National’s Commercial Lending team with 12 years of banking experience, during which she worked as a credit analyst, loan underwriter and, most recently, as a business development officer. Patricia D. Canada—Promoted to Assistant Vice President, Branch Manager at First National Bank’s Old Forest Road Branch. Canada has held progressively more responsible roles since joining First National in 2004 and provides leadership for the Old Forest Road Branch in its current location; she will manage the relocation to its newly constructed branch in 2016. Tammie W. Griffin—New Ecommerce Sales Representative at First National Bank. Griffin brings years of sales and sales management experience and has received multiple awards in recognition of her accomplishments. In her new role, Griffin will be meeting with commercial customers to assist with merchant services and business online and deposit account services. AnnMarie W. King—New Assistant Vice President, Branch Manager, at First National Bank’s Timberlake Branch. King will ensure a smooth transition for the branch team and customers as the Timberlake Branch works in its temporary location until relocating to its newly renovated branch in 2016. She brings to the position many years of experience in retail branch management and mortgage services in the Timberlake area. Jeffrey S. Walker—New Assistant Vice President, Branch Manager, at First National’s Main Branch. He joins First National Main Office team with 25 years of experience in the banking industry as a bank examiner and loan officer.